The Red-eared Slider is a semi-aquatic turtle native to Southern United States but can be found throughout the country East of the Rockies. It is the most popular pet turtle in the United States. 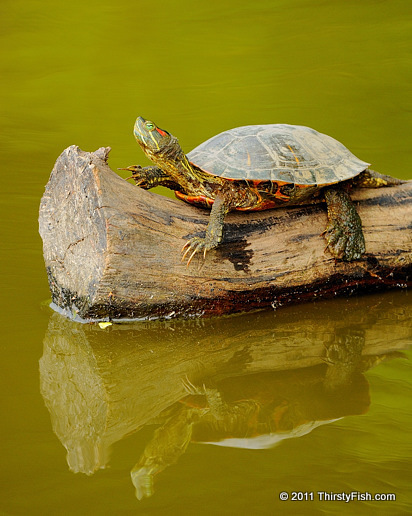 Red-eared Sliders are in the same family as Painted Turtles and can often be observed basking in the sun together. They are slightly larger than their cousins and can be easily identified by the distinctive red mark around their ears. When the Teenage Mutant Ninja Turtles were revealed to be specimens of the Red-eared Slider, there was a craze to keep them as pets in some parts of the world. The pet trade, release of unwanted turtles into the wild and the high adaptability of the species has led to the Red-eared Slider appearing in the 100 of the World's Worst Invasive Alien Species list (currently #93). At the John Heinz National Wildlife Refuge where this photograph was taken, the invasive Red-eared Sliders are in competition with the native Northern Red-bellied Cooter, which is listed as a threatened species in Pennsylvania.